This week I’m going to show you some acupressure points for conceiving. Acupressure points don’t work like magic buttons to make you conceive but they will help prepare your body to conceive. These points will help balance hormones and improve circulation to the uterus and lower body. 関元 (CV 4) – Find the belly button. The first one is four finger widths below the belly button. This is called Conception Vessel 4. Press it with middle finger supported by index and ring finger. 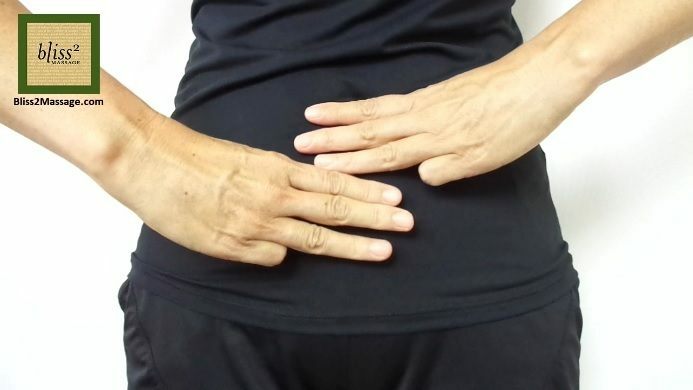 曲骨 (CV 2) – Go down 6 finger widths from the belly button. It’s right above the pubic bone. This is called CV 2 or Conception Vessel 2. Since you are right above the uterus, gently press this point with a middle finger supported by index and ring finger. 横骨 (K 11) – From the previous CV 2, go half a thumb width to the sides. So you can put a thumb on CV 2 and they are located next to the thumb. These are called K 11 or Kidney 11. Again, gently press these points with a middle finger supported by index and ring finger on both sides. It is a good idea to lie down on your back to press these points on the front of the body as you relax. 血海 (SP 10 ) – Bend your knees. The first point is two thumbs or three finger width up from the upper inner corner of your patella or kneecap. It’s right above the depression by the knee when you firmly straighten your leg. Press these points on both sides with hooked thumbs or one side at a time with overlapped thumbs. When you press with overlapped thumbs anchor your hands around your thigh and gently spread open the back of the knee to save your thumbs. This point is called Spleen 10. 三陰交 (SP 6) – The next point is four finger widths up from the inner ankle bone. If you go up from the ankle bone you’ll feel a dip on the border of the shin bone and most likely it’s painful to press. This is called SP 6 or Spleen 6. Press these points with hooked thumbs on both sides, or overlapped thumbs with both hands on the shin. Gently bring the shin muscles to save your thumbs. Here’s overlapped thumbs with the hands wrapped around the leg. You can also raise your knee if that’s more comfortable. Find the position that works for you. 太渓 (K 3) – The next one is the depression between the inner ankle bone and the Achilles tendon. This is called K3 or Kidney 3. You can simply pinch the depressions next to the Achilles tendon on both sides with your fingers. 次髎 (UB 32) – The next set of points are on the sacrum. Sacrum is a triangular bone at the base of the spine. As you can see there are four holes for the nerves on each side. Feel these holes on your sacrum. Each of these holes is the acupressure point. It may be easier to bend forward to feel them. For conceiving, press especially the second ones from the top. These are called UB 32 or Urinary Bladder 32. Unless you are very flexible and strong it’s hard to press these points with fingertips so once you learn the location you can press them with your knuckles while you are sitting in a chair. Press these points as you breathe deeply for one minute once a day or twice a day. So these are what you can do at home yourself. I also recommend acupuncture. But if you are scared of needles, don’t do it because stress can make it harder to conceive. If you are not scared of needles and if you are open to the idea, I would look for an acupuncturist specializing in conceiving or pregnancy.